This article & its comments made me realize that there was a disconnect between parents & schools. 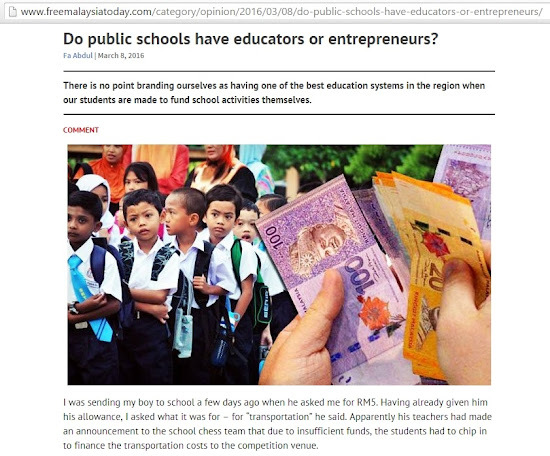 I also thought that this article was an unfair representation of the 400k+ educators in Malaysia. This was why I wrote this response. I had to stand up for my peers & inform parents of what's really going on at schools. Thanks for sharing your opinion. You've made some interesting observations & I applaud your courage for speaking up. I would like to comment on some of the observations you’ve made & give the public some food for thought, from the eyes of a jungle teacher. Take it with a pinch of salt; I’m not saying that I’m correct; I’m suggesting that perhaps this article is a little lopsided & a cikgu should be allowed to voice his opinion too, no? Boleh, kan? 1. "I remember having to walk around my old town in Penang collecting contributions for jogathon events... Today, donkey years later, we are still doing the same thing." You’re right. This is happening at all schools because what we are expected to achieve, by the public & by the ministry, far exceed the resources [i.e., time, personnel, talent, & funding] that we have. With the current recession, school budgets have been shrinking with each passing year. Therefore, schools try to be as proactive as possible. Can you blame them? The last time I checked, participation at such events were optional. If you’re short on funds, it’s okay not to contribute. 2. "Private colleges give talks during school assemblies to promote their colleges; independent book stores hold book fairs inside school premises; even App developers promote educational tools to school kids, encouraging them to tell mommy and daddy at home about their wonderful products." If instructional time is used for such fairs, the school has some explaining to do. Otherwise, I think that Study Fairs & Book Fairs are a good thing. Students should be aware of the courses & scholarships available to them. It’s an opportunity for them to talk to the admission officers in the flesh about what it would take to be admitted into that college. I would also encourage them to go to book fairs too. Books sold there are usually cheaper & vetted to be relevant to them. HOW I WISH THEY DID THIS AT MY RURAL SCHOOL. Honestly, you city parents don't know what you've got. Also, if you don't think it's all that wonderful, you don't have to buy it. 3. "At times, even parents become consumer targets. I remember once while attending my daughter’s school PTA meeting, I had to sit and listen to a representative from a sales company present and demonstrate their water filter machine for a good 45 minutes!" I’m sorry that you had to sit through that. This is not common practice at ALL schools. Thinking about it, perhaps there is a valid reason for it? Did you talk to the organizers of the event? Does it happen every year? 4. "Seriously, schools should not be asking money from their students. If they have insufficient funds, instead of charging students to represent the school, the school board should stay away from participating in inter-school competitions or other co-curriculum activities." We’re all feeling the pinch of the economy. But, I think that interschool competitions & other co-curriculum activities complement the classroom academic activities. Children benefit tremendously from BOTH. Where else will your child develop their soft skills & leadership skills which are essential to their value in the job market? It's not something that can be learned in the classroom. You have no idea how it feels to put hours of work into a competition & then get told that there’s no funding for the team. Happened to me multiple times at my rural school. Imagine having to convey this piece of news to a group of eager students whom you’ve held back after class for hours & hours of training? As I mentioned earlier, the need for funding is inevitable; expectations will only ever increase. I agree that teachers should focus on educating. But, the fund-raising still needs to be done. Teachers are the unsung free volunteer labor in this regard. Please don’t join the hordes of people telling us what to do. JOIN US & WORK WITH US. If parents are willing to step in & play a more active role at schools, what a different school environment we will have. Parents, it’s never about us, teachers, versus you, parents; it’s all about us together against ignorance & the degradation of this society that we love. Perhaps it’s time for you to pay a visit to your child's school & spend some time talking to the leaders & staff? You should get FIRST-HAND information & walk a mile in the shoes of your child, the prefects & his teachers to get a clearer picture of what's really going on. I'm sure the school would be more than happy for a concerned parent to volunteer his/her time & help out with one of the hundreds of programs they run each semester for the benefit of their students. You might be the FIRST parent in the history of the school to do so. I hope that you'll consider my suggestion. It'll make for an interesting follow-up article, wouldn't you agree? If anybody has any further questions or if you would like to be a part of the solution, I’m sure you know where to find me.